Learning Italian is easy with Italian Teachers! 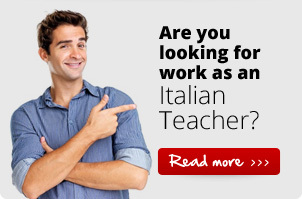 native-speaker Italian teachers will come to you. needs and learning style, so you will make rapid, enjoyable progress. traditional language school system and came up with an alternative that encourages faster and more interesting learning at your convenience. Whether you want to learn General Italian for a holiday or need to improve your Business Italian, we can provide a Italian teacher who meets your requirements, wherever you are in the UK. Take your Italian classes at a time and place that suits you. Decide on the focus of your Italian course; learn Italian according to your individual needs. Fully-qualified, experienced, native-speaker Italian teachers. The fastest way to achieve fluency in Italian. ©2019 Learning Italian is easy! One-to-one or small group Italian lessons when and where you want them.